The cost of federal elections is going up. The tab for the 2012 election is breaking records, with $4.2 billion raised through Sunday on the races for the White House and Congress. Never before has so much money flowed into federal races. Much of it comes from the unlimited fundraising power of so-called independent groups, including super PACs. By comparison, around $3.8 billion -- an eye-popping amount on its own -- was raised for the 2008 election. In the presidential race, those supporting President Obama have spent $931 million so far, while those supporting Republican challenger Mitt Romney have spent more than $1 billion, according to the Center for Responsive Politics. A big chunk of the money is coming from the uber-wealthy, according to election experts. Some 149 super-rich donors gave $500,000 or more, contributing $290 million of the funds raised so far, according to analysis by the Center for Responsive Politics and the Center for Public Integrity. When all the numbers roll in, some $6 billion could be spent on the election. The jump in large-dollar spending harkens back to a 2010 Supreme Court decision that corporations and unions have the right to political speech and their contributions can't be limited. 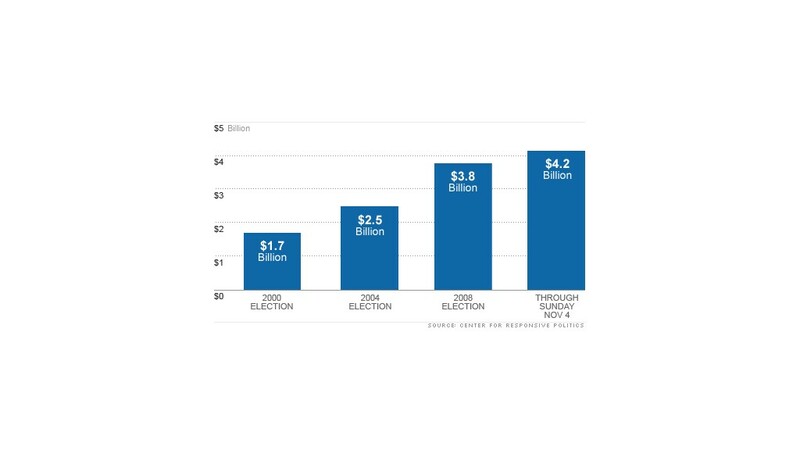 That Citizens United decision opened the floodgates to unlimited spending by independent groups, and gave rise to super PACS, which have become more of a tool of wealthy donors. "Now, it's unambiguously legal to spend whatever you want on whatever kind of message you want," said Bob Biersack, a senior fellow at the Center for Responsive Politics who spent 30 years at the Federal Election Commission. 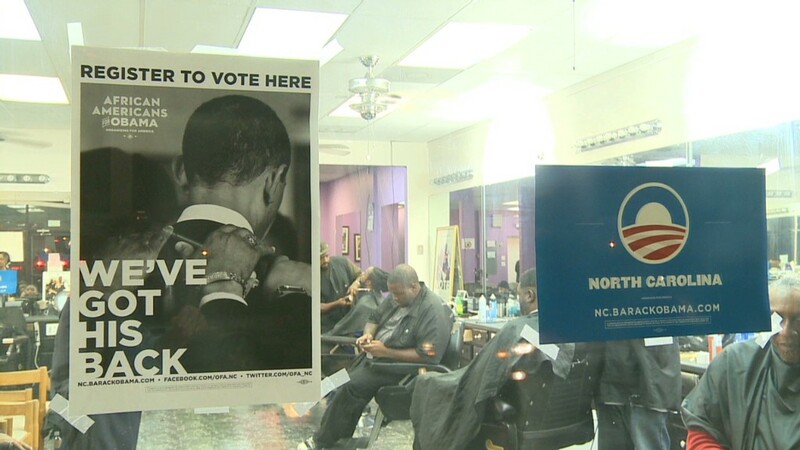 "That's new and what we're seeing as the major force in this campaign election." What has that money bought? In the race for president, $750 million bought time for 1.1 million TV ads since April, most of them running in nine battleground states, according to analysis by Kantar Media's Campaign Media Analysis Group. "You, obviously, have immense amounts of money and phenomenally few undecided voters. But, campaigns don't care about efficiency, they care about winning," said Ken Goldstein, president of Kantar Media's Campaign Media Analysis Group. "If you spend $500 million and you win by half a percent in Ohio, that was worth it, even if it's a lot of money per vote." Presidential television ads have been running mostly in Colorado, Florida, Iowa, Nevada, New Hampshire, North Carolina, Ohio, Virginia and Wisconsin. What's worrisome to watchdog groups is that the super PACS and other groups raising millions are supposed to be independent from candidates. But the watchdog group Public Citizen recently found that 60% of super PACs have devoted themselves to helping just one candidate. And many of those super PACs are founded, funded or operated by friends, family members or political allies of the candidate they support, said Taylor Lincoln, research director of Congress Watch at Public Citizen, an advocacy group. The groups believe the weaker the firewall between high-dollar contributions and candidates, the greater pressure those elected could face to reward top donors of these independent super PACs that helped them win office. "There's a lot of $100,000-plus contributions, and that's what campaign finance laws set out to avoid," Lincoln said. "People who give that much enjoy a special place in that newly elected official's mind."